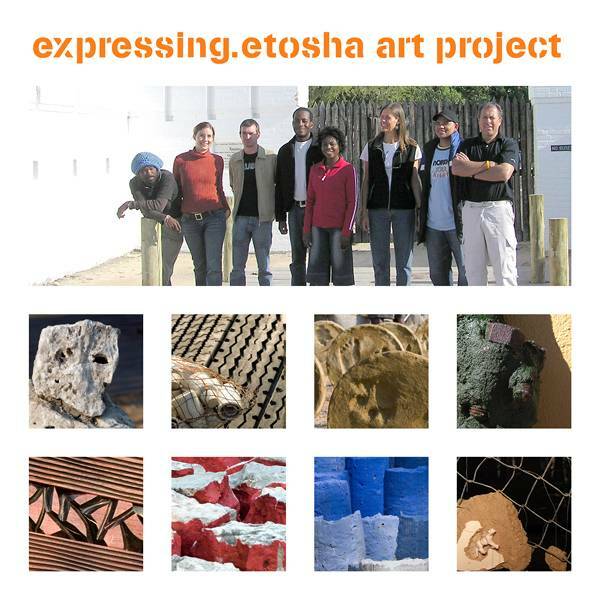 expressing.etosha (2007) is an art project initiated by visual artist Imke Rust. 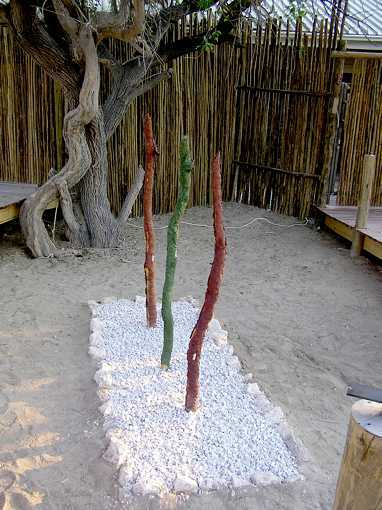 A group of renowned Namibian artists have been invited to work on site-specific art installations in Namutoni (Etosha National Park) in an attempt to integrate art into everyday life and tourism activities. The artworks create a direct, accessible and interactive dialog between art(ists), nature, man-build structures and human beings. 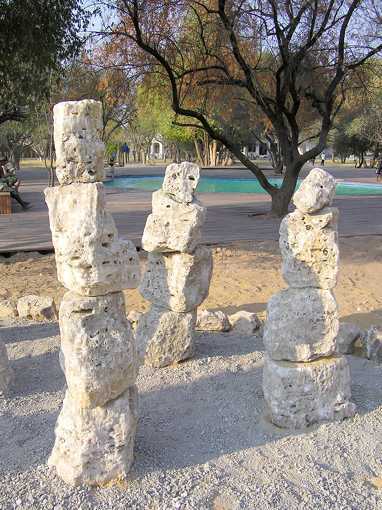 The participating artists are well-known Namibian artists who have experience in similar art approaches. Three emerging artists/students have been invited to join the project to gain experience and exposure. Through this project locals and tourists can encounter art as part and parcel of their relaxing visit to the Etosha National Park. The artworks will be installed permanently and are thus available for visitors to the park throughout the year. They are installed at various locations of the rest camp’s public area and can be enjoyed at anytime. The project has been accompanied by a exquisite catalogue and a documentary exhibition at the National Art Gallery of Namibia. The catalogue can be downloaded from here. Hercules Viljoen, (1957) currently the Head of the Visual Arts Department of the University of Namibia, has been awarded several public and private commissions in Namibia and abroad and is the coordinator of Tulipamwe. He has participated in various international artist’s workshops. In his art he prefers to engage in site-specific artwork, usually incorporating a response to the social, cultural or historical environment. Wiebke Volkmann, (1964), is a multi-media artist, who successfully integrates art into other spheres of society like holistic management of natural resources and enterprises. She has recently worked with performance art integrating her intimate relationship to soil and land-use patterns in the past and present in Namibia and reflecting on the global dynamics of how we relate to the basic processes that support life on earth. Imke Rust, (1975) two times winner of the Standard Bank Namibia Biennale, a young multi-media artist who has recently returned from her DAAD stipend in Berlin. Besides being an artist, she also curates exhibitions, writes articles about art, has initiated the Berlin-Windhoek artistic exchange project: “Shared Experiences” and actively promotes art and art awareness in Namibia. She is the initiator and facilitator of the expressing.etosha art project. Shiya Karuseb, (1972), mixed-media artist, who has exhibited extensively in Namibia and abroad and participated in several international artist workshops. Land is conquered in a horizontal movement, while dreams are growing upwards, believes the artist and invites us to dream of a better future with his dream column. 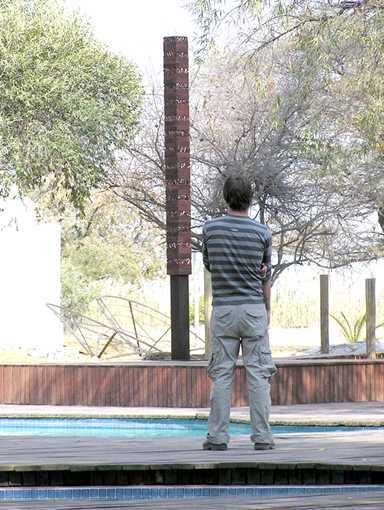 The column is created from the same foreign Purple Heart wood which is used for the walkways and decks at Namutoni, thus connecting the horizontal movement of foreign and local visitors around the camp to the vertical structure on several literal and symbolical levels. Medium: Window frame, copper tubing, bed linen all from Namutoni, tyre rubber, copper wire, isolators, elephant dung and seeds. 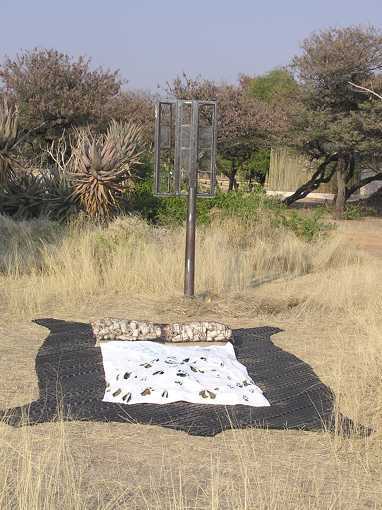 A bed made of natural and synthetic materials placed on the ground invites us to interact with nature in a more intimate and harmonious way. The different materials used bring up many different associations, about life, death, communication, dreams and regeneration. Over time the duvet filled with seeds and fertile soil will allow grasses to grow through the embroidered footprint openings. 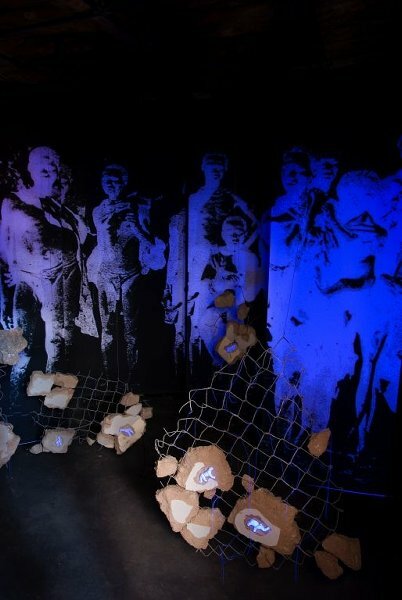 Etosha Sympathetic Magic is a site-specific artwork installed in an historical prison cell that forms an integral part of its significance. The work is meant to provide a mystical stimulus to the visitor while it may, at the same time evoke aesthetic and cultural awareness. The title refers to aspects of rock art, dream and trance, while the combination of elements signifies symbolic aspects of conservation, survival and history. The work can only be viewed through a small hole in the old wooden door, leading to the cell. According to an old myth the Etosha Pan was created by the tears women who wept for their murdered children and men. The figures made out of salt blocks embody these mythical women and once it rains, they will start weeping again, as the combination of water and salt will create a natural tear solution. Over time the rain will erode and dissolve the salt pillars, symbolically bringing the myth back to life and encouraging transformation and transcendence, reminding us that the only time that exists is NOW. Medium: Limestone from demolished buildings at Namutoni, clay, natural wood, wire and PVA paint. Created form limestone originating form old buildings on site, this work symbolises humanity’s historical path. 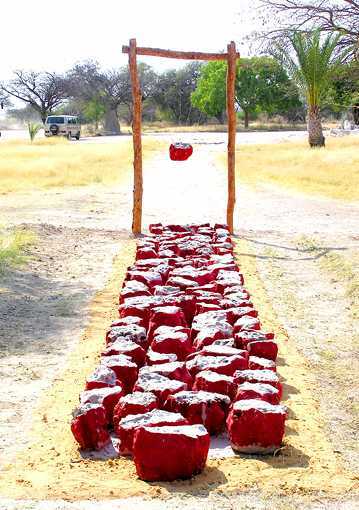 The artist envisions it as three eras: the clay era when humans solved conflict through violence (represented by clay from the Etosha Pan), the limestone era, of finding ways for a peaceful reconciliation (represented by the white limestone path with the historical red ‘blood’ flowing away on the sides), and finally the gate that will lead humanity into the marble era of absolute peace, abundance and happiness. This work is based on the hopscotch game, inviting the visitors to Namutoni to interact with it in a playful manner. 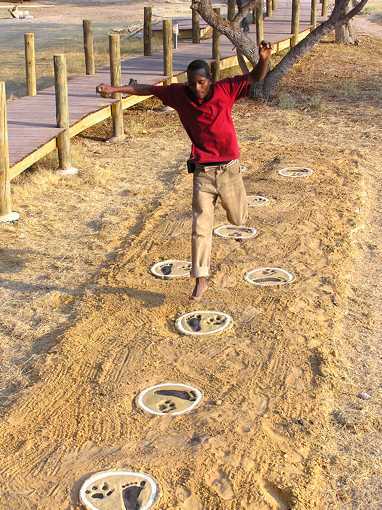 Children and young-hearted adults can jump along the discs, while contemplating the relation between humans and animals, as symbolised by the animal and human footprints embedded in the discs. 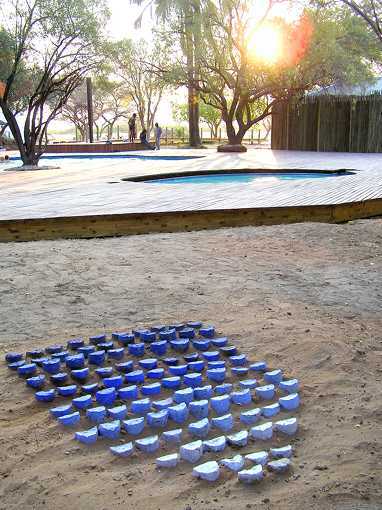 Taking the water of the Etosha Pan as a reference, the artist has created an abstracted representation of the movement and reflections of the water. The separate parts of blue concrete also remind us of the cracks formed in the pan once the water evaporates and the surface dries in the sun. Its location close to the swimming pool in Namutoni creates another direct link to water in the camp. Medium: natural wood, resin, sand and found objects from Namutoni. This work explores the functionality of different structures and compares man-made structures like the fort or chalets with termite heaps found in the Etosha National Park. Namibia Wildlife Resorts – who have kindly agreed to host the artworks as well as accommodate the artists during the installation process. A special word of thanks to the staff at Namutoni who have made us feel so welcome and comfortable during our stay! Bank Windhoek Arts Festival – who have provided the funding for this project. B-Mobile Car Rental – who have provided transport for the group of artists to Etosha. Venture Publications and German Embassy in Namibia. Art historian Dr Meredith Palumbo has volunteered to write the text and photographer Leigh Daniz of Inner Vision Photographic Studio, to document the artworks.